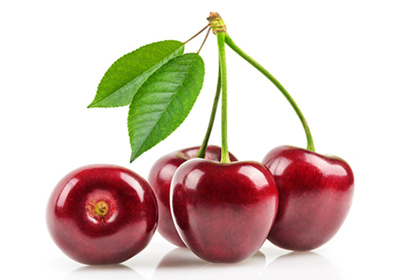 Cherry is at present one of the favorite fruits of consumers. According to data of previous year, cherries have replaced banana to be the first imported fruit of worth in China. Yantai is the main cherry producing area of China. With the development of e-commerce, Yantai’s e-commerce operators have started cherry business in Taobao, WeChat. Development of cherry electric business attracts more and more foreign business platform, micro business giants to Yantai for direct purchase, and entrust logistics to a courier company. However, when delivered by a courier, the goods undertake at least 14 times of loading and unloading manually in small packages .It is difficult to protect the delicate cherries in the transport of high demand. As early as 2015, Jiuye supply chain began to provide for the original cherry operators low temperature transportation service, from Yantai to Beijing, Shanghai, Guangzhou, Wuhan, Chengdu and other cities, and then distributed to the surrounding consumers. In the low temperature environment, after the pre-cold, cherry kernel temperature is reduced to 0 ~ 1 ℃ or so, the respiratory effect to a minimum, almost dormant, through the appropriate packaging, and refrigerated trucks, the cherry shelf life is extended , meanwhile, the cost of transportation is greatly reduced. In the beginning of promotion of large cherry cold chain transportation, many businesses have a doubt: can cherries be pre-cooled in the refrigerated trucks since the pre-cooling equipment costs are high? The answer is no. Refrigerated trucks are not equivalent to pre-cooling equipment, as cooling rate of such trucks is very slow. Experimental data indicate that fruits of 29 ° C without pre-cooling reduce by only 10 ° C after 2 days on a refrigerated vehicle. High fruit temperature causes serious fruit water loss and a lot of breath heat. Fruit temperature at the beginning is not falling but will rise when the fruit box is closed. After 2 days of transport, the basic refrigerated trucks have arrived the destination without any effect to keep fresh, so pre-cooling effect of refrigerated trucks is not good. 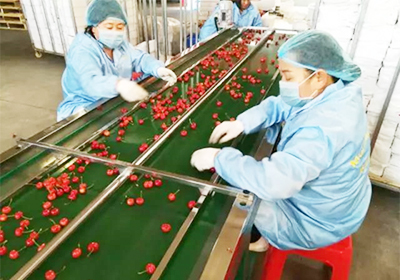 JIUYE Supply Chain began in 2017 to attempt the first step in the cherry cold chain preservation technology - cherry water pre-cooling technology. The important role of water precooling is promoted vigorously to the businessmen, and Jiuye Yantai operation center also purchased a cherry water pre-cooling + sorting equipment, to solve the high cost of equipment procurement, headache of local businesses. Through the pre-cooling + cold chain transport + refrigerated packaging and distribution, Jiuye supply chain successfully managed difficulties of cherry cold chain transportation under the current circulation environment.